Æthelflæd (868 – 918) was the eldest daughter of the beloved Saxon King Alfred the Great and was chronicled in the historical record as Myrcna hlæfdige, or ‘Lady of the Mercians’. Born to Alfred, King of Wessex and his queen, Ealhswith of the House of Mercia, Æthelflæd (meaning “noble beauty”) knew only strife and warfare. The Danes (or Vikings, if you prefer) had been harrying the Saxon shores in an attempt at conquest for generations, but during the reign of Alfred their ferocity had increased under the leadership of a warrior called Guthrum. Alfred could not stand against them, and took to paying them a tithe in order to stay out of Wessex. Although ostensibly there was peace, Guthrum attacked the royal household at Chippenham at Christmas 878. Alfred and his young family had to flee on foot through the woods, struggling to make it to a stronghold island fortress in the Somerset marshes, known as Athelney. Here Alfred came up with a bold plan, a vision for the future that the young Æthelflæd absorbed at her father’s knee. Alfred knew that to be strong, the Anglo-Saxons also had to be united – metaphysically as well as physically – under the same religion (Christianity) and adhering to the same canon of law. The crumbling Roman fortifications needed to be rebuilt and there needed to be a system where they could be manned year-round without neglecting the harvest, which so often happened in wartime, leading to famine. As other kingdoms fell under Danish rule, still Wessex remained defiant, and the Saxon ealdormen began to flock to Alfred’s banner and make his vision of a united country their own. Alfred eventually triumphed over Guthrum, but it was a hard-won peace. Although Guthrum converted to Christianity and vowed not to enter Wessex again, Alfred had to give up swathes of Anglo-Saxon territory, mainly East Anglia and the eastern half of Mercia, to create a new Danish kingdom (hereafter known as the Danelaw). The territory also included the Mercian city of London. Alfred’s capital was in Winchester, which is where Æthelflæd grew into her teens during this short period of uneasy peace. It was likely that Alfred knew all along it was only to be a short peace. For the six years afforded to him he worked to codify the laws of the country, formed a fine navy, rebuilt towns and cities that the Danes had sacked, and created a clear administrative system to control taxation and promote trade. He began to style himself as “King of the Anglo-Saxons” as opposed to merely King of Wessex. The Ealdorman of Mercia was one Æthelred, who hated the Danes even more than most for the destruction they had wrought on his kingdom. He traveled to the court at Winchester to learn more about Alfred’s intentions for fortifying the Saxon kingdoms and there became impressed with the pre-teen princess, every inch her impressive father’s daughter, who spoke to him knowledgeably about defying the Danes. 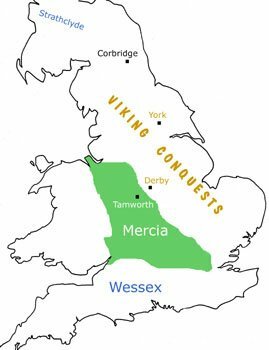 Æthelred returned to Mercia and wrestled control of most of the western half back from the Danes (the historical record is tantalisingly unclear as to how exactly he managed this feat). In 884 he sent for Æthelflæd, now around sixteen, with the promise to not only make her his consort, but his co-ruler in Mercia, an almost unprecedented position for a woman, even the daughter of the great Alfred. Alfred himself was thrilled, seeing the union of Wessex and Mercia through marriage as another step towards his dream of a fully unified “Britannia”. Alfred wasn’t the only one to recognise the importance of this alliance. As Æthelflæd and her party made their way to Mercia for the marriage, the Danes attacked. Cool as anything, Æthelflæd commandeered a nearby ditch and used it as a military trench, defeating the enemy. In triumph she arrived at her new kingdom and was married. Wessex and Mercia – or Æthelflæd and Æthelred – proved to be a dream team. In 885 a fresh band of Vikings appeared in Kent. The duplicitous Guthrum came to their aid and a furious Alfred joined together with his daughter and son-in-law to put Guthrum down. When they did, London and its territories was returned to the kingdom of Mercia. The uneasy peace with Guthrum and the Danelaw resumed. Æthelflæd knew well what to do with the gift of a period of peace. Like her father before her she focused on securing and fostering trade and security, moving from one city to the next, rebuilding and fortifying, making Mercia a power to be wary of. In 888 she gave birth to her only child, a daughter, Ælfwynn, a difficult birth that left Æthelflæd unable to conceive again. Ælfwynn was doted upon, kept close to her mother and brought up to be a military leader. 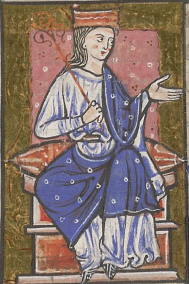 Æthelflæd was given wardship of her brother’s son and heir, Æthelstan – the future king – and Ælfwynn was favoured with the same treatment and education as her illustrious cousin. Ælfwynn, however, never left her mother’s side to marry, and some historians assume this was because Æthelflæd’s long-term plan was for Mercia to be assimilated into Wessex, and so did not want for there to be a ‘Mercian’ heir. Æthelflæd and Æthelred continued to wage battle against the Danes, focusing on the midlands and into the north, whilst Alfred and his heir – Æthelflæd’s brother Edward – did the same in the south. Alfred died in 899, and Edward continued the fight. Having grown up closely with his sister, theirs was a natural alliance, and one that Æthelflæd needed more than ever, as in 902 her husband Æthelred was struck down by a strange, wasting disease.He was bed-ridden for the rest of his life, useless as a ruler, especially in this time of war. Vikings chased out of Ireland tried to settle in Chester, but they were not peaceful. Æthelflæd led her army to Chester, where she barricaded the city against the Danes, orchestrating a defense that involved large stones being dropped from the battlements. The canny Danes of course just approached the walls with shields held defensively above their heads. Æthelflæd’s answer to this was to drop beehives instead, coating the Danes and their shields with sticky honey and associated colonies of furious bees. Chester was saved and continued to prosper. By the time Æthelred succumbed to his strange illness in 911, Æthelflæd had long considered to be the ruler of Mercia in all but name. After she became widowed, she took on the portmanteau Lady of the Mercians, as opposed to Queen, wary not to offend any sensibilities and jeapordise her already socially precarious position. But in truth Æthelflæd was highly respected and beloved. She was respected even by the Danes; chroniclers record how many Vikings surrendered to her without a fight. She proved herself not only a skilled military leader, but also a talented tactician. The Annals of Ulster, for example, state that her military success was ‘through her own cleverness’. In 917 it finally seemed as if the matter of the Danes in Britannia would finally be decided. Æthelflæd – along with a alliance of kings (Anglo-Saxon, Welsh and Scottish – showing that even the Celts and Picts respected her) attacked the Danes in the city of Derby. It was a resounding victory, one so complete that the Danes of Leicester and York (great Viking strongholds) had absolutely no recourse but to surrender. With dreadful timing, Æthelflæd died only days before the Danes would have surrendered York to her, recognising her as their overlord. No record remains to tell us what the lady died of; perhaps it was of battle wounds, but then again, Æthelflæd was around 50 years old, which was considered quite elderly at the time. She was mourned throughout the land and by all its people, even the Danes, who recognised her as a more than worthy adversary. She was buried in Gloucester, a city she had reconstructed from its Roman ruins, and laid out the core street plan, which is still that in existence today. She was succeeded as ‘Lady of the Mercians’ by her daughter, Ælfwynn, until her brother Edward came to assimilate Mercia into Wessex. It is likely that Ælfwynn lived out the rest of her life in a convent. 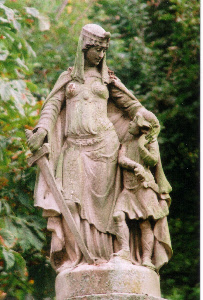 Æthelflæd was remembered as the ‘perfect’ leader; a formidable warrior, tempered by her gender to be kind and fair, brought up by her famous father to be intelligent and forward thinking. For all that she was careful to never be known as ‘queen’ in her lifetime, she comes down to us in history as exactly that. In the words of the Annals of Ulster, she was Famosissima Regina Saxonium, the “most famous Queen of the Saxons”. Not sure how I did not discover this site before, in my research on Lady Aethelflead for my soon to be published biography of her. The festival in Gloucester next year sounds wonderful- of course, a new statue is merited.